I haven't sewed much this week. Getting ready for Wednesday's rollout at work consumed most of my energy; by the end of each night, all I wanted to do was turn into a little couch lump. Dragging myself to the sewing machine wasn't a high priority; rest and antacids were. It still feels a little strange, knowing that I'm actually keeping this quilt once it's done. me! I'm keeping it! Neener! 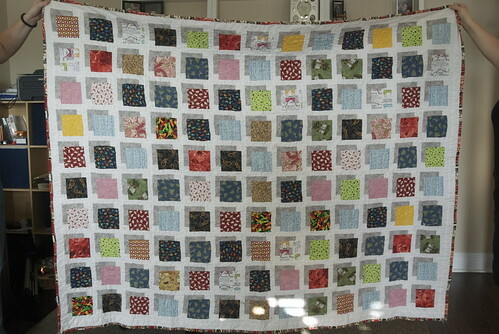 This quilt isn't kid-friendly, or work-safe, or any kind of two word sobriquet. It's also not tactful or tasteful. It's also not being given away, which is a first. Read more about Armchair quarterback quilting!